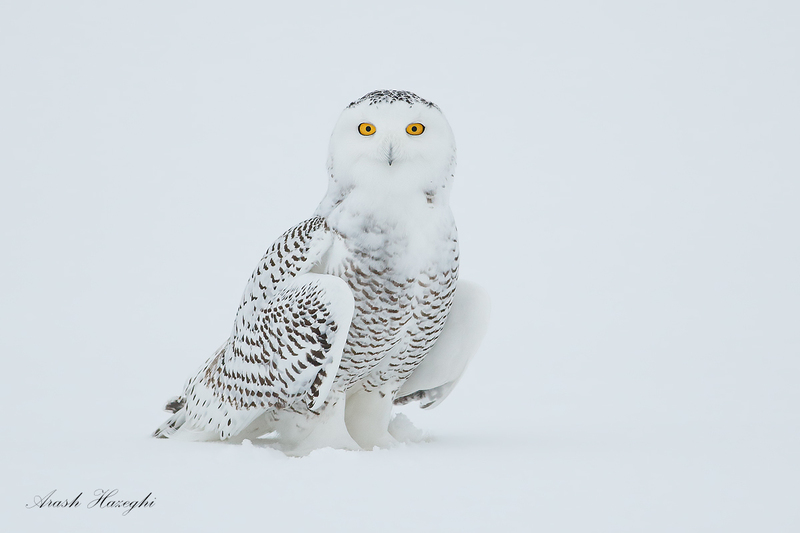 Back in December, I traveled to Ottawa and while in town I had an opportunity to photograph a handsome snowy owl in the area, with my friend Daniel Cadieux. 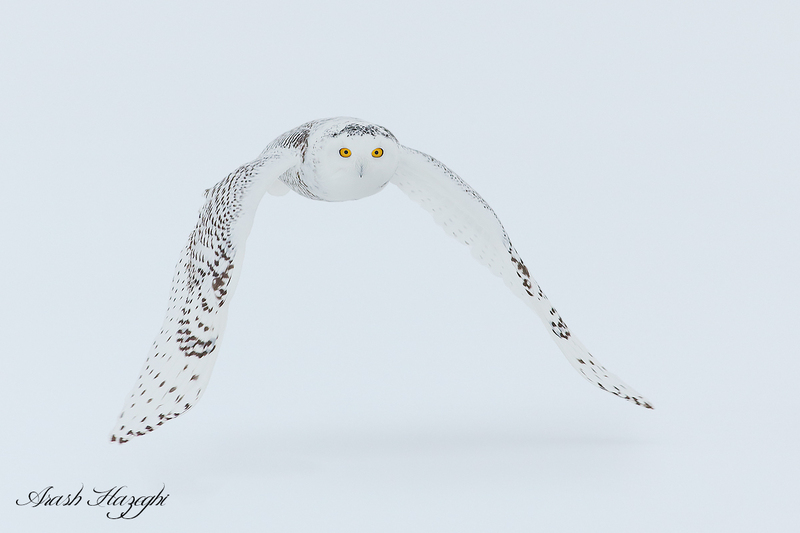 Dan is a great photographer based in Ottawa and fellow moderator on BirdPhotographers.net, his inspiring works depicts many northern species in their habitat. While this month saw the coldest temperatures recorded for some time across the US, Ottawa in Dec. is not warm by any means. One morning the temperature fell to -20C (-4F) which can cause serious discomfort in presence of even a minor breeze, not exactly a holiday destination. This wasn’t intended as a photography trip but I decided to take my gear anyway. The trip did not start smoothly. I had booked my flight with Air Canada and the first thing I learned in the airport, was that they weighed my carryon, a ThinkTank international roller bag that holds my EF 600 MKII, 1DX, usually a backup body, a light telephoto lens and my standard EF 70-200 f/2.8L II, plus chargers, batteries etc. The airline had a 22-lb limit for carry-on and of course my bag was heavier. Upon taking out everything except for the 600 II, the bag was still about 24 lbs (assuming the scale at the airport showed the correct weight). Faced with fierce resistance of an Air Canada employee at the counter, I was forced to cancel my flight and settle for a redeye flight scheduled for later that night. I never had an issue traveling to Canada with Delta which I usually fly with. As a result I decided to just take my light ThinkTank backpack with EF 400 f/5.6 L lens instead to avoid any hassle at the gate. The flight was not very comfortable as it was too hot inside the cabin, but it got me there. So far it doesn’t sound like a memorable trip. Once in Ottawa, I contacted Dan to see if he was available for shooting, I did not expect much because we had not made any prior plans. But I was really lucky that Dan had located a beautiful snowy a few days earlier. I spent a Saturday afternoon shooting. Had I known about the snowy, I would have definitely brought an EF 300 f/2.8 MKII, but Dan was generous to let me borrow his EF 500 f/4 IS II for most of the shoot, and what a light lens! please click on the images below to see larger, you can use your arrow keys to navigate between images. 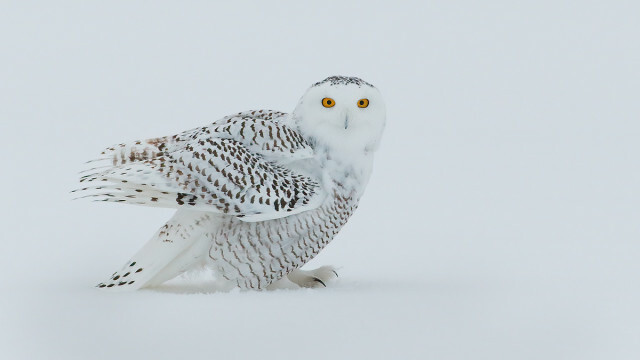 Female Snowy owl standing on snow. EOS 1DX, EF 400 f/5.6L, f/5.6 1/2000sec ISO 2000, handheld. Of course, an image like this immediately puts a smile on your face and makes up for all the prior trouble. We had some flight opportunities and two types of background to work with, pure white snow and a cloudy sky which was a shade darker. 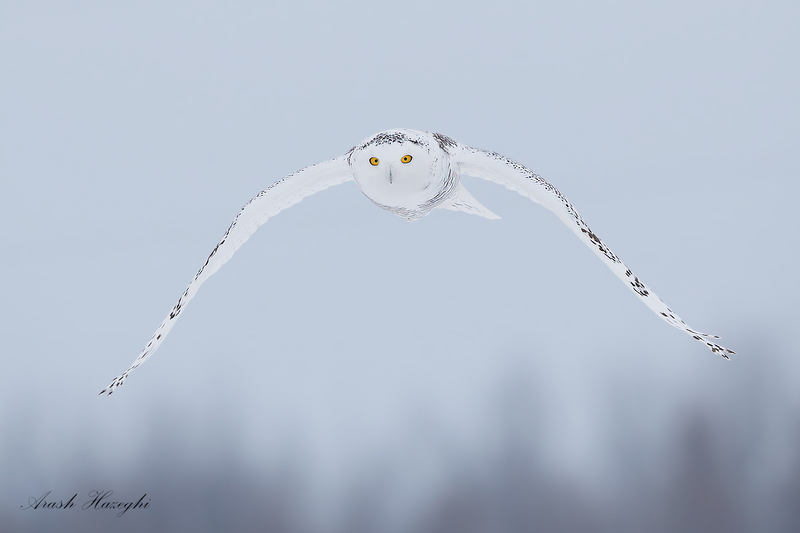 Having overcast light is one of the best conditions for photographing snowy owls. First, it depicts the winter habitat. 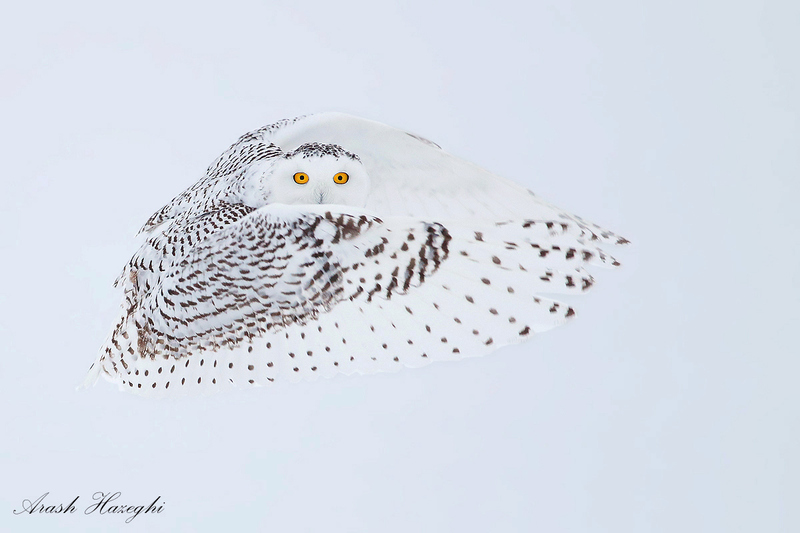 It also shows how effective the natural white “camouflage” works for the owls when flying against snow. There were many times that I could not immediately find the owl in the finder, despite of her being close and right in front of me. Snow owl against snow. EOS 1DX, EF 400mm f/5.6 L, f/5.6 1/1600sec ISO 2000 handheld. At times it is difficult to locate the owl in the frame, especially if you momentarily lose it. The other advantage of shooting in overcast condition is that you can shoot from any angle. With sunny skies, you are limited to a narrow angle where the sun is effectively behind you. More often than not, it happens that the best pose or the most dynamic frame is the one with sun to your side casting shadows on some parts of the owl. Fortunately we did not have to worry about this issue. The following frames are my personal favorites of the trip. The spirit of Ottawa. 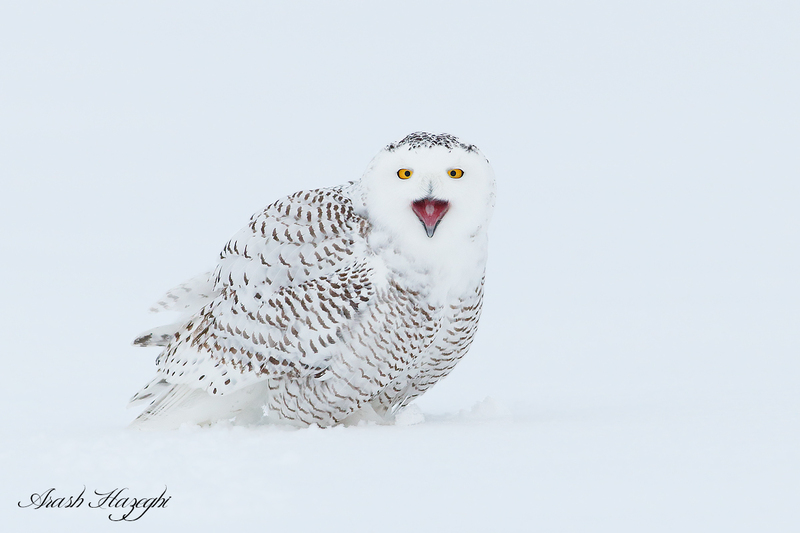 Snowy owl against snow, EOS 1DX EF 500mm f/4 IS II, f/5.6 1/2500sec ISO 1250 handheld. Background was snow. Many thanks to Dan for letting me borrow his 500. The cloudy sky is a bit darker than the owl which is pure white, this can create dramatic scenes, it also helps the details stand out a bit better. Another advantage of shooting in overcast condition is that the owl’s eyes are often wide open. 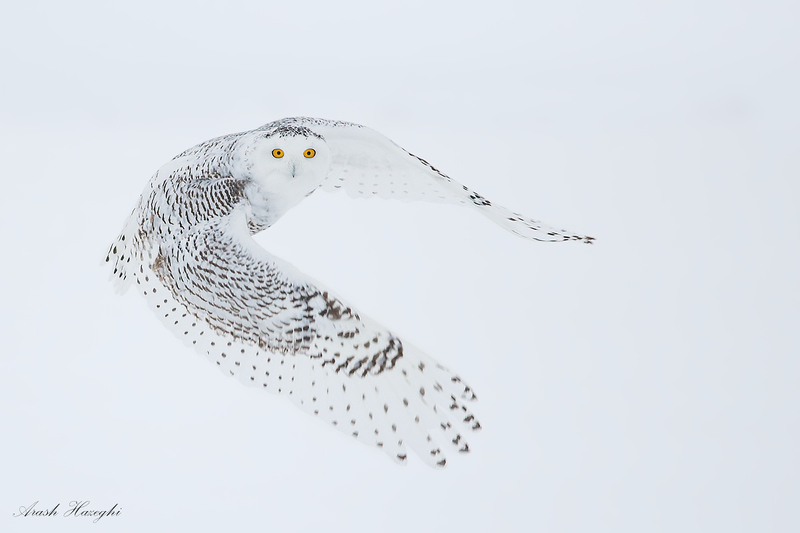 Snowy owls’ large, bright yellow eyes surely make them standout and much more photogenic. Two years ago, I traveled to the coast of Washington to photograph snowy owls which had migrated to that area from a winter eruption up north. We had sunny skies during my second trip and one major issue was that owls’ eyes were often partially or fully closed resulting in a dull photo. This time thankfully this was not an issue. The ninja owl. EOS 1DX, EF 400mm f/5.6L 1/1600sec ISO 200 handheld. The snowy gave us great eye contact. 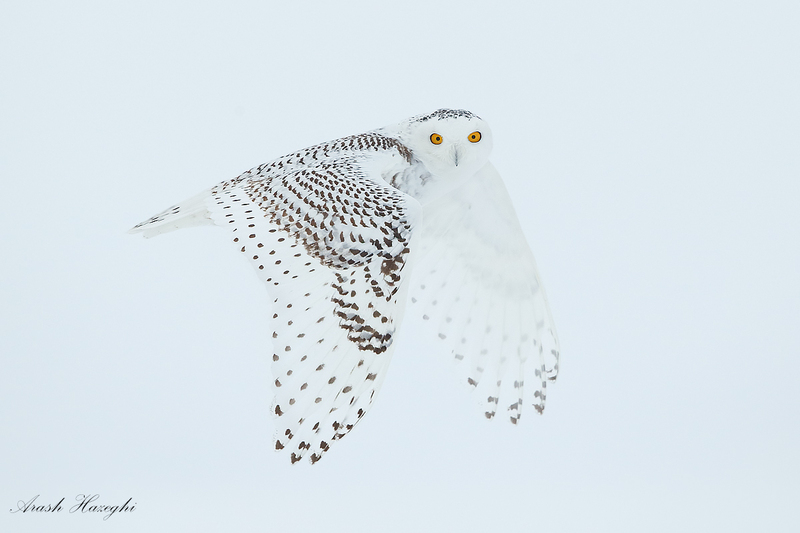 The snowy owls fly very quietly, you can barely hear them when thy are close to you and they can also fly very close to the ground. 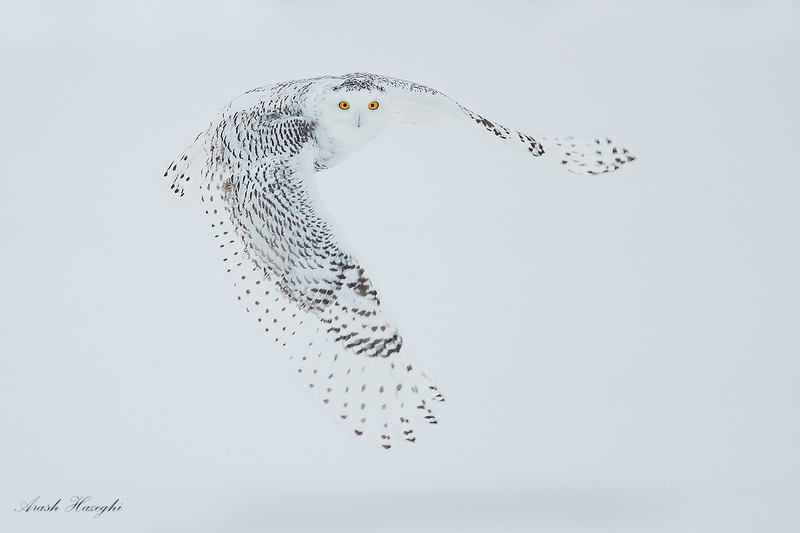 Snowy owl gliding above the ground. EOS 1DX, EF 500mm f/4 IS II f/5.6 1/2500sec ISO 1250 handheld. Click on the image to view larger. 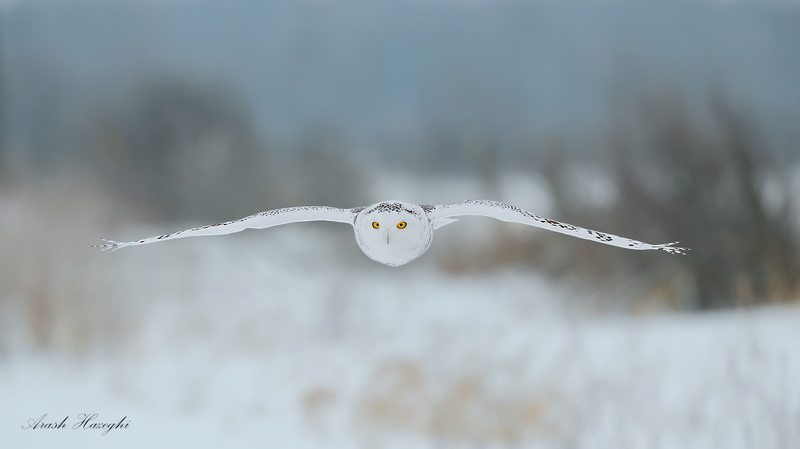 Snowy owl approaching. EOS 1DX EF 500mm F/4 IS II f/5.6 1/3200sec ISO 1600 handheld. Click on the image to view larger. I went to shoot with Daniel again on a Saturday morning, the day before I left. This time we started before sunrise. I decided to warm up with some high ISO shots. It was quite dark but fortunately high ISO is not a problem for the 1DX. I had to crank up the ISO to 10,000 to get the shutter speed up since I was using the EF 400mm f/5.6. Snowy owl. EOS 1DX EF 400mm f/5.6 1/1600sec ISO10000, handhold. image made before dawn. Processing DPP 3.13 and Photoshop CS6. The snowy gave us quite a few interesting poses. She started calling a few times when three crows were passing by at a distance, they took the warning seriously and immediately left the area. Those powerful talons settled the argument quickly! Snowy owl calling. EOS 1DX, EF 400mm f/5.6L f.5.6 1/1600sec ISO 3200. handhold while lying on snow. Finally I wanted to share a quick tip for exposure and processing when both subject and background are pure white. In this case it is best to use manual exposure, the white background fools the camera’s meter causing sever underexposure as it sets the brightest whites to neutral grey. Take a few test shots before starting to shoot and set your exposure manually such that the image is not dark but at the same time it retains the subtle textures in the snow (avoid overexposing). 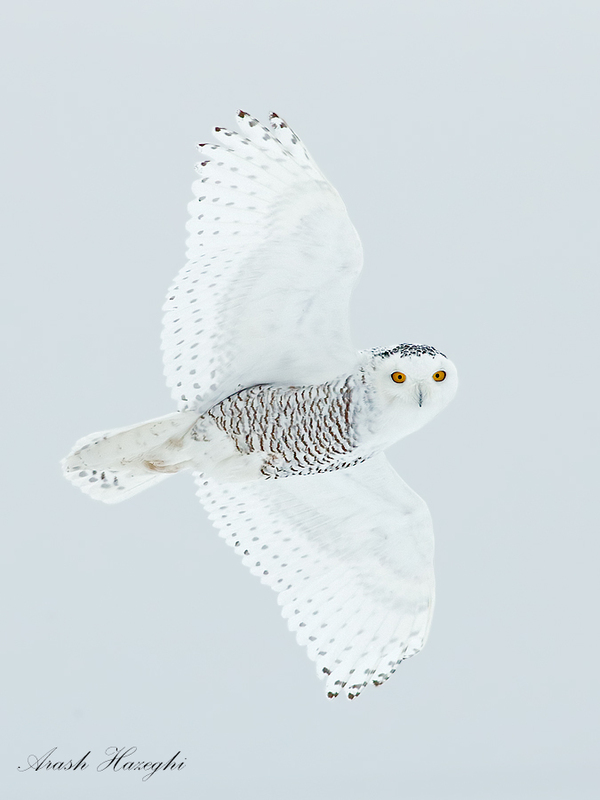 This is a good starting point as the snowy owl has the same exposure as the snow. In post processing fine tune exposure such that the brightest white is at 240-245 level. (you can set it back a little bit if you wish to show more texture in the snow). In such condition (clouds and snow) the reflected sky light from snow has a blue cast. When you check a white point, the RGB values should be close to each other. If blue channel reads noticeably higher than red and green, it means image has a blue cast. You can achieve correct color balance by either adjusting color temperature in the RAW convertor or simply warm up the image in Photoshop. I used warming filter (Image–>adjustment–>PhotoFilter–>warming filter (81), density=6%-8%). You can also try to recover some of the texture in the snow by very gentle use of the burn brush (set to highlights, exposure=5%). 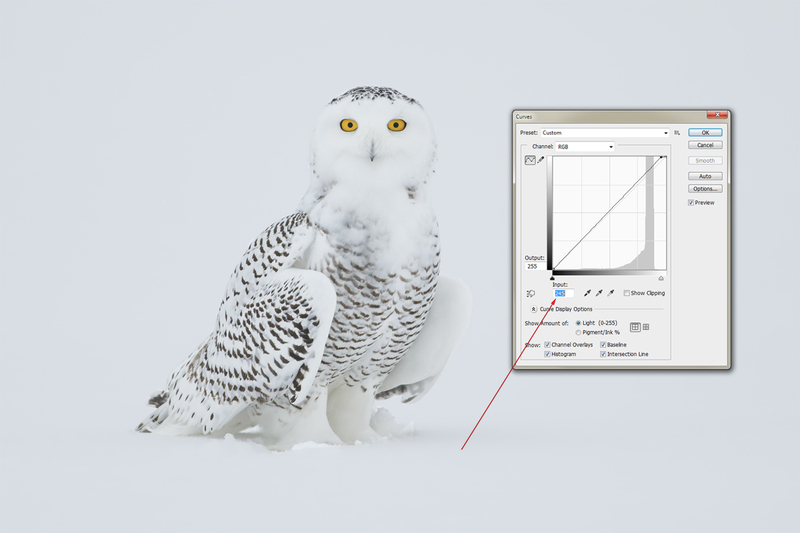 Curve tool in Photoshop is an easy way to set white point for this image. finally the last frames shows how close to the ground the owls usually fly. I tried to maintain the subtle shadow on the snow while making sure the overall brightness was set correctly. I hope you have enjoyed the images and the quick tips. Thank you so much for a wonderful story of Snowy Owl . If you don’t mind, can you email me a direction or location . Also, I bought one of your ebook . That was a great ebook. Hey Arash, nice write-up that brings good memories of late December. It was a worthwhile trip that yielded you many super photos of this species! Not sure which I like best, but the “ninja” sure is memorable.